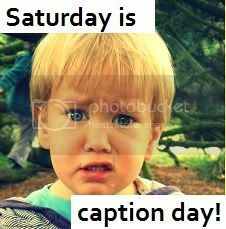 So I am away on a hen weekend but I could not miss out on this weeks Saturday is Caption Day as I love it so much! So Come up with your best caption for this and I shall look forward to reading them when I get back and shall also check your out! See you soon! Dont turn around but i think we’re being followed! Mummy’s gone off and left the dog in charge again! Mums choice of an experienced sheepdog for the family pet was proving useful. I think we’re being tailed! Looks like it is just me and you and a dog named Boo. Ok, on my mark, split up and we’ll try to lose the tail. Quick before the dog gets our chocolate stash! I think we might be being followed! Kerry sent the kids truffle hunting again, to pay for the weekend away! we’re going on a bear hunt… we’re going to catch a big one…. The Beast of Bodmin Moor was quite tame, really. Aim, ready, run! A toddler-fest! We best pick up our pace, the dog is gaining on us! Would love you to link this one to Country Kids too. Such a cute one holding hands!